Hi (never home)makers! I wanted to share my healthy living story with your readers because I recently finished a half marathon (full recap here)! I started training about 3 years ago. I was in recovery from an eating disorder which had controlled my life completely for 7 years, and I needed a healthy focus. I wasn't training for anything in particular back then. I mainly used workouts from Ross Enamait's books and trained with my partner, Mike. We did lots of different strength and conditioning routines, and I believe finding exercise helped my recovery a great deal. I slowly started to focus my attentions on gaining strength and slowly became less worried about the number on the scale and the food I was eating. I'm not saying exercise cured me -- I had to see a psychotherapist weekly for CBT and other treatment. I also attended two self help groups organized by Seed (a local eating disorder charity and had a huge amount of support from Mike) . . . That boy put up with a lot! But the exercise gave me another reason to eat enough because when I didn't eat enough, I couldn't work out properly. I've been in recovery for 2-3 years now, and I'm happy to report that I'm OK most of the time. Though I still have some problems, they are manageable and they aren't on a level where they are unhealthy. I'm very careful to maintain a healthy weight and fuel my workouts well both before and after! I joined a boxing gym with Mike last year in August, initially just for fitness but I soon realized I wanted to compete. My competitive streak is just too strong! After I'd been boxing a few months, I discovered how useful running was for fitness and begun running once or twice a week. I started to really love it, especially when I could beat my old times and really see improvement. When I started, I struggled to run 1 mile in 9 minutes. Now I can run 1 mile in under 7 minutes! Mike and I decided in January that we would like to do some fund-raising for Seed since they helped me so much in my recovery. 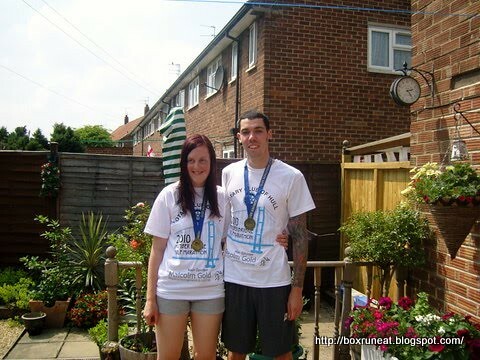 Despite us both being novice runners, we decided we would like to run a half marathon and give our sponsors to Seed. 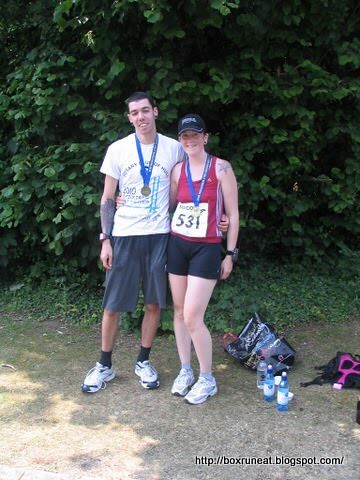 As I mentioned above, we both completed the half marathon . . . and -- the best part -- Mike proposed at the finish line! 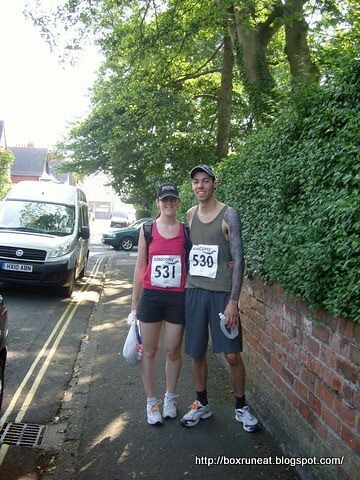 I'm still fully in recovery from the eating disorder and my blog documents all my boxing and running training (with the odd recipe thrown in for good measure)!